As usual, recent Ferraris have exquisite proportions, quite large (borderline enormous) size but in places messy details. 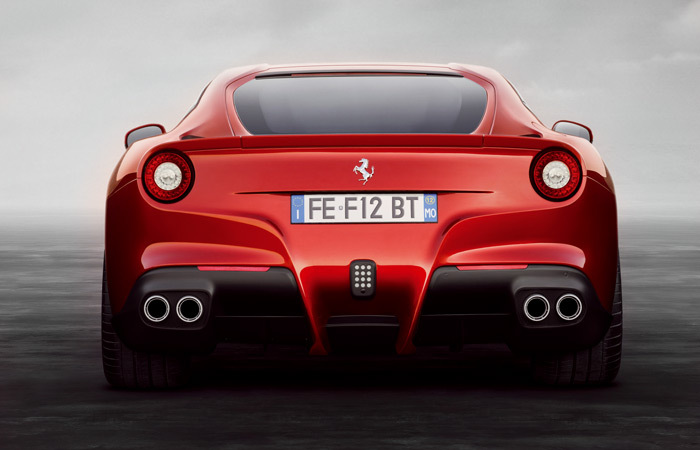 The F12 is no exception; it looks aggressive and elegant, with flowing shapes and lines that accent its mechanical layout. The two places where the details are lacking are located at the bumpers. At the front, the borderless (like FF’s) grill looks like an afterthought and by covering a bigger area than the actual inlet it makes it look disproportionally big. At the rear the tightly packaged transaxle doesn’t allow for a huge (and largely pointless) diffuser (like the one in 430) and there is a strange continuous shape that flows from the light cluster level to the floor spoiling the simple and elegant look of the rear end. Apart from those details the exterior design is spot on, beautiful and purposeful although without any breakthroughs. 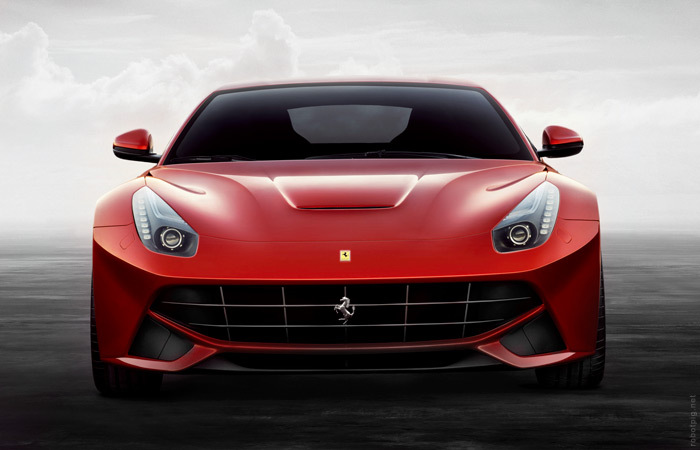 Mechanically the F12 is an evolution of previous and current Ferraris. It has an updated version of the V12 found in FF that produce 740ps, a transaxle with a dual clutch gearbox (probably similar to the Gertrag unit of the FF) and an aluminum monocoque frame made by Scaglietti. The chassis is similar to the other Ferraris since the 360 (with the exception of Enzo) and in this case it is lighter and slightly smaller in dimensions. Ferrari didn’t invest in a hybrid powertrain or a cfrp monocoque. 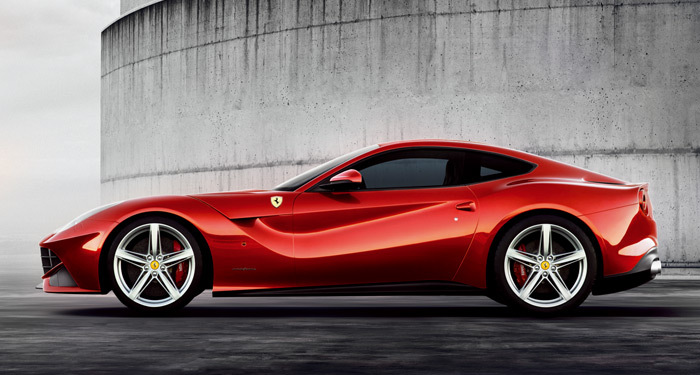 The F12 isn’t the most high tech car of its class but it is far from outdated and it may be the best. Weight distribution is slightly rear biased (and will become almost even when braking). A lot of work has been put in the aerodynamic performance of the car. 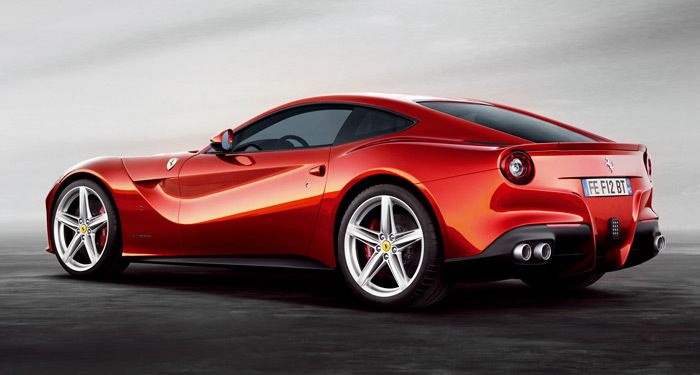 The Cd is a very good 0.299 and Ferrari claims 123kg of downforce at 200km/h (76% more than 599). This number may sound big but it is only around 7% of a actual car’s weight and when put into perspective it is in the upper limit for a road car. More downforce will impose a stability risk for a car without moving aerodynamic surfaces. 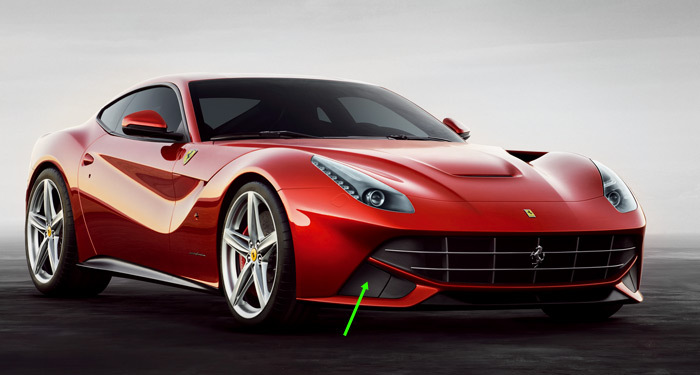 However there is a small accent of movable aerodynamics, at the lateral front inlets there are flaps (green arrow in the photo) that open or close to cool the brakes. Similar devices are used in many smaller cars and at F12 they are mostly a talking point rather than a significant device. 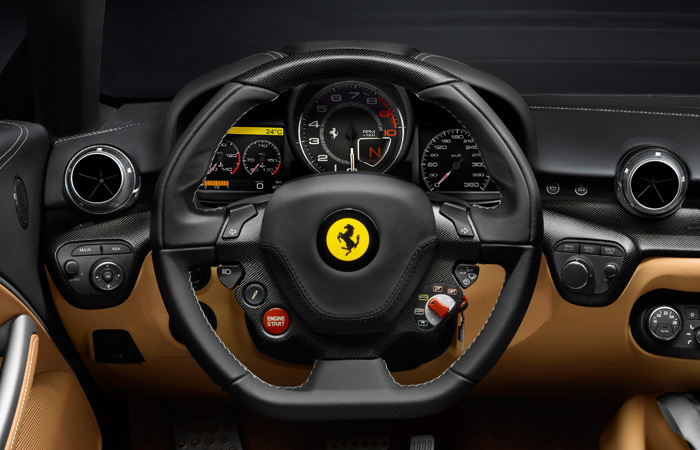 Judging from the photos he interior is what expected from Ferrari, slightly more conventional than the one used in 458, more discrete than the borderline kitsch Aventador and not even close to the Lexus LF-A. Using unpainted carbon fibre as a non-structural decorative element is the definition of a fashion statement destined to age badly but that is a sin almost every car manufacturer is keen to commit. Concluding this very brief presentation you can watch a flyover of the car and a test drive from Ferrari’s F1 drivers. For -slightly- more details you can read the official press release here (pdf).